For the currency of Sweden, see Swedish krona. For the Swedish monarchy, see Monarchy of Sweden. Portrait of King Władysław IV Vasa in coronation robes (detail), wearing the "Swedish Crown"
The Swedish Crown, also known as the "Purchased Crown", was a part of the Polish Crown Jewels. The crown was made for King Sigismund II Augustus. After King's death it was pawned to Giovanni Tudesco and later ransomed by King Sigismund III Vasa for 20,000 florins and used for his coronation in Uppsala as the King of Sweden on February 19, 1594. In 1623 King Sigismund III bequeathed it to the Polish–Lithuanian Commonwealth, and it was included in the State Treasury at the Wawel Castle after king's death in 1633. The appearance of the crown was a type of corona clausa, consisting of five larger and five smaller parts (portiones maiores quinque, minores quinque) and 262 precious stones, including 24 emeralds, 64 rubies, 30 sapphires, 21 diamonds and 123 pearls. In the 18th century the crown was depicted in the portrait of Sigismund I the Old by Marcello Bacciarelli, painted to embellish the Marble Room at the Royal Castle in Warsaw. ^ a b c d e Michał Rożek (1987). Polskie koronacje i korony (Polish coronations and crowns) (in Polish). p. 82. ISBN 83-03-01914-7. This Poland-related article is a stub. You can help Wikipedia by expanding it. This royalty-related article is a stub. You can help Wikipedia by expanding it. Poland was ruled at various times either by dukes or by kings. During the latter period, a tradition of free election of monarchs made it a uniquely electable position in Europe. Szczerbiec is the coronation sword that was used in crowning ceremonies of most Polish monarchs from 1320 to 1764. It is currently on display in the treasure vault of the Royal Wawel Castle in Kraków as the only preserved piece of the medieval Polish Crown Jewels. The sword is characterized by a hilt decorated with magical formulas, Christian symbols and floral patterns, as well as a narrow slit in the blade which holds a small shield with the coat of arms of Poland. Its name, derived from the Polish word szczerba meaning a gap, notch or chip, is sometimes rendered into English as "the Notched Sword" or "the Jagged Sword", although its blade has straight and smooth edges. 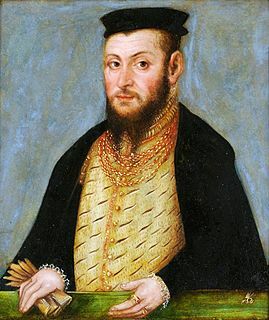 Sigismund II Augustus was the King of Poland and Grand Duke of Lithuania, the only son of Sigismund I the Old, whom Sigismund II succeeded in 1548. Sigismund III Vasa, also known as Sigismund III of Poland, was King of Poland and Grand Duke of Lithuania, monarch of the united Polish–Lithuanian Commonwealth from 1587 to 1632, and King of Sweden from 1592 as a composite monarchy until he was deposed in 1599. He was the son of King John III of Sweden and his first wife, Catherine Jagiellon. Władysław I the Elbow-high or the Short was the King of Poland from 1320 to 1333, and duke of several of the provinces and principalities in the preceding years. He was a member of the Piast family of rulers, son of Duke Casimir I of Kujawy, and great-grandson of King Casimir II the Just. He inherited a small portion of his father’s lands, but his dominion grew as some of his brothers died young. He tried for rule of the Duchy of Krakow in 1289, after the death of his half brother Leszek II the Black and the withdrawal from contention of his ally Bolesław II of Masovia, but was unsuccessful. After a period in exile during the rule of Wenceslas II, Władysław rebounded to re-assume some duchies after Wenceslas’ death, and then gained Krakow in 1306 after the murder of Wenceslas III. He temporarily took control of part of Greater Poland after the death of his ally Przemysł II, lost it, and then regained it later on. He conquered Gdansk Pomerania, and left it to familial governors. For defense of this territory he turned to the Teutonic Knights, who then demanded an exorbitant sum or the land itself as an alternative. This led to an extended battle with the Knights, which was not resolved after either a papal trial or Władysław’s own death. Perhaps his greatest achievement was gaining papal permission to be crowned King of Poland in 1320, which occurred for the first time at Wawel Cathedral in Krakow. Władysław died in 1333, and his reign was followed by the rule of his more renowned son, Casimir III the Great. Coronations in Poland officially began in 1025 and continued until 1764, when the final king of an independent Poland, Stanisław August Poniatowski, was crowned at St. John's Cathedral in Warsaw. Most Polish coronations took place at the Wawel Cathedral in Kraków, but crownings also occurred in Poznań and at Gniezno Cathedral. Whenever practical, Polish coronations were conducted as close as possible as to the date of the previous sovereign's funeral. This was explained by Joachim Bielski in the sixteenth century as osoba umiera, korona nie umiera, or "the person dies, the crown dies not". With the emergence of an independent, republican Poland after World War I, coronations in the Polish state have been rendered obsolete. The Battle of Stångebro, or the Battle of Linköping, took place at Linköping, Sweden, on 25 September 1598 (O.S.) and effectively ended the personal union between Sweden and the Polish–Lithuanian Commonwealth, that had existed since 1592. In the battle, an army of c. 8 ,000–12,000 commanded by Duke Charles defeated a mixed force of c. 5,000–8,000 consisting of an invading army of mercenaries in the king's employ and diverse but poorly co-ordinated supporting Swedish noblemen's forces commanded by King of both Sweden and the Polish–Lithuanian Commonwealth Sigismund III Vasa, who was acting to maintain and restore his personal union against anti-Catholic forces in Lutheran Sweden. The Swedish kings general Constantin fought at the western bridge. The only surviving original piece of the Polish Crown Jewels from the time of the Piast dynasty is the ceremonial sword – Szczerbiec. It is currently on display along with other preserved royal items at the Wawel Royal Castle Museum in Kraków. Crown of Maria Josepha was made for Archduchess Maria Josepha of Austria, wife of King Augustus III of Poland, for her coronation as Polish queen in 1734. The Crown of Augustus II was intended for his coronation as a King of Poland. The crown was made in 1697 by Freiburg's goldsmith Johann Friedrich Klemm. It was not used, however. The Augustus II's crown is kept in Dresden Armory (Rüstkammer) in Dresden, Germany. The Crown of Augustus III was made in 1733 for Augustus III's coronation in Kraków in 1734. Elizabeth of Bosnia was queen consort and later regent of Hungary and Croatia, as well as queen consort of Poland. The Grunwald Swords were a gift presented by Ulrich von Jungingen, the Grand Master of the Order of Teutonic Knights, to King Władysław II Jagiełło of Poland and Grand Duke Vytautas of Lithuania on 15 July 1410, just before the Battle of Grunwald (Tannenberg). The gift, a pair of simple bare swords, was a formal invitation to the battle. After the Polish-Lithuanian victory, both swords were taken as a war trophy by King Władysław II to Kraków, Poland's capital at the time, and placed in the treasury of the Royal Wawel Castle. The Crown of Bolesław I the Brave was the coronation crown of the Polish monarchs. The so-called Muscovy Crown was a part of the Polish Crown Jewels. It was made in about 1610 in anticipation of Prince Władysław Vasa's coronation as Tsar of Russia, which was also known as Muscovy. Due to his father's opposition and a popular uprising in Russia, he never actually took the Russian throne, despite being elected by the Seven Boyars. Nevertheless, until 1634 he used the title of Grand Duke of Muscovy. The Hungarian Crown was a part of the Polish Crown Jewels. It was made in the 16th century, resembling the Crown of Saint Stephen, as a private crown of John II Sigismund Zápolya. The Funeral Crown, also known under its Latin name as the Corona Funebris or Funebralis, was a part of the Polish Crown Jewels. It was probably lost before 1669. The Homagial Crown, also known under its Latin name as the Corona Homagialis, was a part of the Polish Crown Jewels. It was mentioned for the first time in the 15th century in the inventory of the Wawel Royal Treasury. It was probably the coronation crown of Władysław II Jagiełło. The Queen's Crown was a part of the Polish Crown Jewels until it was destroyed in 1809. It was mentioned for the first time in the inventory of the Wawel Royal Treasury in the 15th century. The Tykocin Royal Castle is a 15th-century castle located on the right bank of the river Narew in Tykocin, Poland. It fell into ruin in the 18th century and its reconstruction began in 2002.